and strengthen your post-baby core (once and for all)! The #1 factor keeping your abdominal separation from healing (and how common yoga poses make it worse). Yoga poses that prevent core-healing (and what to do instead). How to effectively strengthen your deepest core muscles and make every pose a chance for healing. A limited time recording will be available if you can't make it live. You must sign up to receive the recording. Enter Your Name and Email to Save Your Spot! 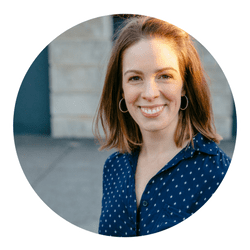 Catherine Middlebrooks, the founder of brb Yoga, is a yoga teacher, postpartum corrective exercise specialist, wife, mom, and the creator of the Heal Your Core with Yoga and Fix Your Hips programs. With the mind of a researcher and the heart of a yogi, Catherine geeks out on the science behind corrective exercise and has helped thousands of moms restore their core strength so they can say YES to life again. Catherine lives in Durango, CO with her husband Paul and their two pre-schoolers. Seats on the live webinar are limited! Reserve your seat now and join us live for the webinar that will show you how to heal your post-baby core (once and for all)!